In response, landlords said many of the UK's mortgage lenders refuse to lend money to landlords whose tenants are on benefits. "I woke up every day at 6am to look for a home," she said. "Everywhere I looked online said 'No DSS' - Gumtree, Facebook, everywhere." "It was so stressful being apart from my family. I'm now suffering from anxiety and depression." "This research shows that blatant discrimination against people on housing benefit is widespread," said Kate Henderson, chief executive of the NHF. "Many housing associations were created in the 50s and 60s in reaction to discrimination and racism from private landlords who wouldn't house migrants, and said 'No Irish, No Blacks, No Dogs'. "Today's discrimination is hardly any different and we refuse to turn a blind eye." "We're very concerned about that, because it treats all tenants on benefits as the same," he told the BBC's You and Yours programme. Many long leases exclude such tenants anyway, the RLA said, although it added that it was difficult to estimate the proportion of leases affected. 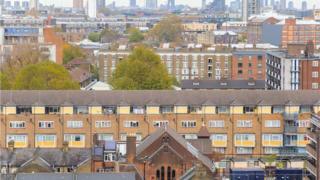 "I was very upset about it, because I find it very inhumane to ask me to find another tenant," she told the BBC.